so....i 've been off the grid for awhile. it's been a couple of weeks since i've posted anything at all, but it's been for a very, very good reason. i've been in ITALY! i've heard from i don't know how many people that italy is a magical place. the cheese, the pasta, the wine! and they were not lying. i don't think i've ever felt more relaxed in my entire life, and this getaway couldn't have come at a more perfect time. recently having left a full-time job and now trying to make it as a freelancer, the timing seemed pretty terrible initially, but now i feel quite sure that it was exactly what i needed to restart, reset, and get into the right mindset to move on to amazing new opportunities. when i shared all of these major career/life changes and my anxiety with my very wise mama, she simply told me, "the universe put that there for you. all of this is happening now for a reason, so just trust and enjoy it." i wish i could always hold onto her surety and faith, because as usual, she was right. italy is a place that reminds you what is truly important in life—good food, good company, and the time to really appreciate every moment of it all. and i needed that reminder at this moment more than ever. italy has so much beautiful scenery it's almost overwhelming, but aside from its over-the-top gorgeous views, it's also a country full of people who really appreciate the simple, sensual pleasures in life, especially food. 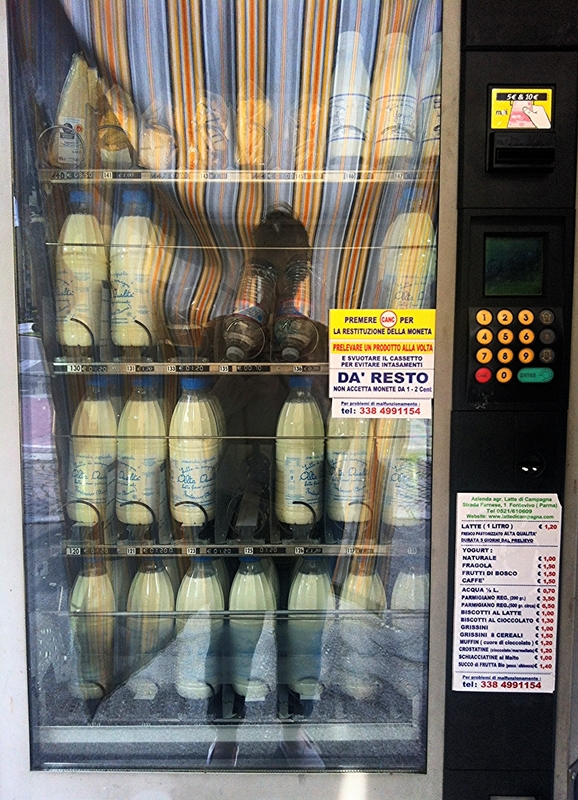 it is, for example, a country with dairy vending machines...yeah. just out on random street corners. and of course, the machines and their precious stock are protected from the hot sun by a cute little striped sheet of fabric (italians seem to think of everything). there are actual wedges of real parmiggiano reggiano cheese up in the top of that thing. map of the official production zone for parmiggiano reggiano cheese in italy. we visited several amazing spots on this trip through the northern part of italy. my boyfriend and i flew into milan and immediately hopped on a train to venice and spent about 36 hours there, and then went on to bologna, parma, and la spezia, spending just a day or two in each town before popping back up to milan for our last night in the country. every place we visited was full of amazing food, friendly people, and lovely sights, but one of the highlights of the trip for me, an excursion i'd been dreaming about since we first booked our flights back in january, was a trip to an actual parmesan cheese-producing dairy just outside the city of parma. parma, of course, is an italian town that's become famous almost entirely because of the two beloved foods it produces—parmiggiano reggiano (parmesan cheese) and proscuitto (cured pork from the leg of the animal, usually served in paper-thin slices). in other words, it was a must-visit. caseificio sociale bassa parmense (a parmesan cheese production facility) outside parma, italy. the dairy and production facility we chose to visit, caseficio sociale bassa parmense, is a quick 15-minute cab ride from parma's city center. it's a good thing it's so close because, though you can opt to tour at any time of day, arriving first thing in the morning allows you to see the entire cheese-making process from the beginning, rather than just checking out the space and hearing it described to you after the fact. Of course, i had to see that, so we arrived promptly at 7:45am to see some workers already getting started with the day's batch. milk being stirred and heated in one of the facility's 13 large copper cauldrons. a dairy worker checks the milk for proper temperature and consistency. he'll test it again and again during the cooking process until he feels it's exactly right. after one large ball of fresh cheese is formed, workers roll it into a cheesecloth, cut it into two more manageable pieces, and wrap them again separately in cheesecloth. the cheese is allowed to drain before moving to the next step. after draining as much liquid as possible from the cheese in the cauldron, the pieces are picked up and moved into large plastic containers. a heavy round lid is slowly pressed on top to release yet more liquid and help the fresh cheese start to take on its famous wheel shape. after a little time in the plastic containers, the cheese is moved into metal cylinders to be pressed even more, releasing more liquid from the cheese. these metal containers also have curved sides (rather than the straight edge of the plastic) giving the cheese its final shape that we're all so familiar with. inside the metal is a large plastic strip with the batch date, dairy code, and official parmiggiano reggiano stamp, so all of that information is pressed directly into the outside of each wheel. after a few days in the metal rounds, the cheese wheels are removed and sent to a salt water bath, where they'll sit for several weeks. the cheeses are rotated regularly so that each little bit of cheese absorbs equal amounts of salt water. the final step before inspection is aging. 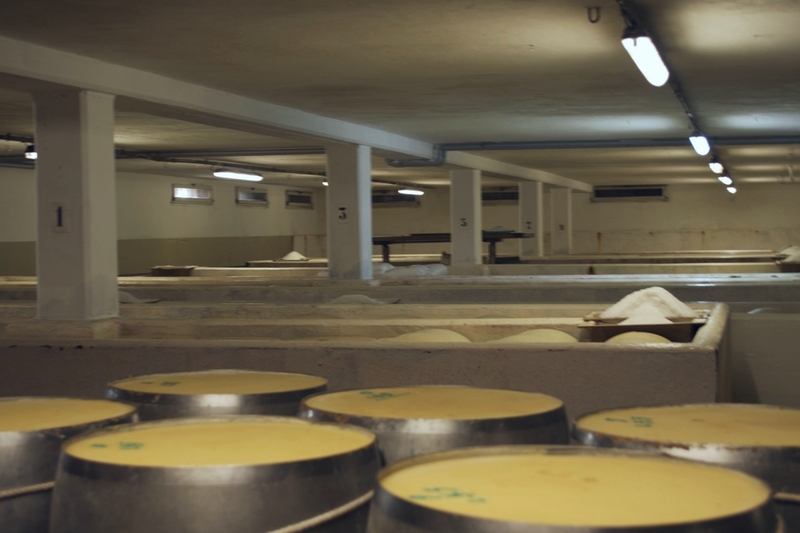 after the cheese wheels are salted, they're placed on large wooden shelves in a room where temperature and humidity is strictly controlled. they'll sit there for a year, again being rotated and flipped regularly, until they're inspected to ensure absolute top quality (anything less than perfect doesn't get the official seal of approval from government inspectors and is marked with large, scraped lines around the outside of the wheel). if deemed perfect, the cheese is allowed to continue aging—parmiggiano reggiano is generally sold in italy after aging anywhere from 20 to 48 months. our tour guide was lovely and SO eager to share everything she could about the parmesan-making process. roberta, the daughter of one of the farmers whose milk gets turned into cheese at this facility, first explained that caseficio sociale bassa parmense is a social dairy, which means that it takes milk from eight different dairy farmers in the area. each farmer's milk is kept separate from the others, so that each piece of finished cheese can easily be traced back to the individual farm. (italians, clearly, really care about where their food comes from.) each batch of parmiggiano reggiano contains milk from both a morning and an evening milking, because the amount of fat in the milk varies considerably depending on the time of day its taken from the cows—and every batch, of course, has to be perfectly balanced. and while there, of course, now machines and technologies that can make this process a bit easier than it once was, she emphasized how important it is to have real humans working in the dairy—at each stage, the milk or cheese is carefully watched and monitored, and only an experienced cheese maker can tell when the milk is heated to just the right temperature and consistency, or when it has rested just long enough for the absolutely massive ball of cheese to form in the bottom of the big copper cauldrons. parmiggiano reggiano just wouldn't be perfect without a warm, knowing human touch. and i think that's just one more thing to love about this deliciously salty, savory, slightly funky cheese with so much history and love behind it. and did i mention we got to taste a few pieces of this totally italian treat right on site?! 'cause that happened. i got so caught up in the amazing, natural process i almost forgot to tell you how insanely delicious it is, but it is so good. after tasting this stuff, it's impossible to think about ever eating the processed, pre-grated stuff that we get in plastic tubs at supermarkets here—it still calls itself parmesan, but it is a liar, a conman wearing a not-so-pretty mask. real parmiggiano reggiano is so full of flavor, you only need a tiny bite or sprinkle to taste its complexity and give a boost to dishes like pastas or salads. * we tasted parmesan at three different ages—10 months (too young, we're told, to even be exported to the u.s.), 24 months, and 38 months. the different in taste was obvious. the 10-month cheese, fresher, less salty and briny, smelled almost like fresh bread and milk to me. the slightly yeasty (but not too funky) scent was enticing, and the flavor of this cheese, too, was milky and rich, the texture softer and creamier than you'd expect from a parmesan. the 24-month, generally the most popular, is a little harder and saltier. hard enough to grate over pasta but still soft enough to easily break off into jagged, uneven chunks and eat on its own. the oldest we tasted, the 38-month, much harder, was almost difficult to break with our hands, and intensely salty, with a lot more of the signature cheesy funk in its taste and aroma. on its own, it was pretty strong, the flavor lingering on my tongue for minutes afterward until i finally gave in and took a sip of water to clear my palate.